Last week we were able to attend the launch of the Audi e-tron in San Francisco. Before the impressive unveiling event, which featured a boat ride across the San Francisco Bay and a show of lighted drones, there was a prior event showing off all of Audi’s technology. There, we were able to get up close and personal with Audi’s other electric cars, the Audi Aicon Concept and the Audi PB18 e-tron. While there, we were able to talk to Gael Buzyn, the designer of the PB18 and the Director of the Audi Design Loft in Malibu. We actually spoke with Gael once before, at the Pebble Beach unveiling of the PB18, but he was kind enough to give us some more time with the car and show it to us in more detail than before. It’s a fascinating car and when you hear him talk about it, it all makes sense. Audi chose a sort of shooting brake design to emphasize that the PB18 is something that its theoretical owner could spend constant time with. It’s far more practical than a traditional supercar and it looks it. That visual recognition of its practicality is something that was important to Buzyn and the Audi Design Loft Team that created it. It even has three pieces of bespoke luggage in the rear cargo area. 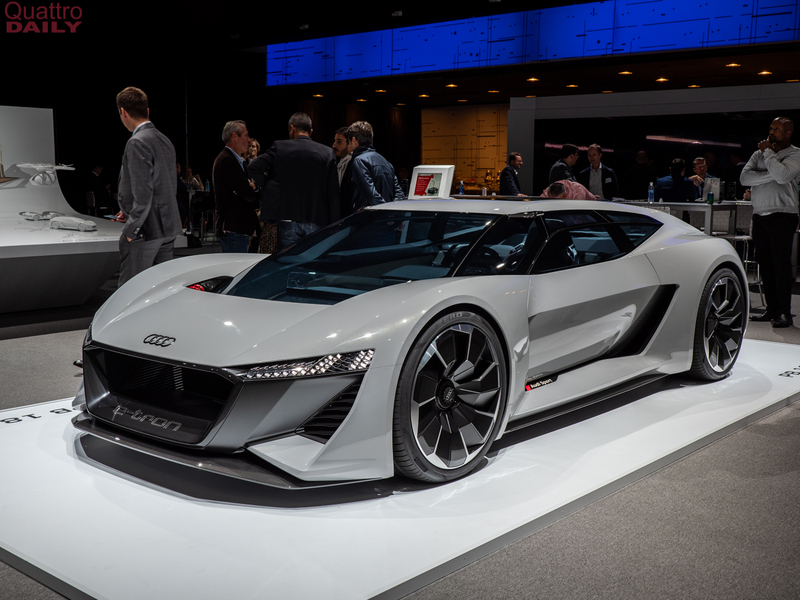 Buzyn also noted that the Audi PB18 e-tron is supposed to be a more emotional electric supercar. Which is why Audi says it’s a “Level 0” car, referring to the fact that it lacks any sort of autonomous driver aids, which are measured in levels 1-5. When you press a specific button in the car, the driver’s seat actually slides over to the middle of the cabin, giving the driver a sort of ‘monoposto’ driving position, much like an F1 car. In fact, Buzyn calls it a combination of a Formula One car and the Audi R18. It’s interesting to hear him talk about the car. Before recording this video, he told us that he loves it and could talk about it all day, as is evident in the video. And he did, as he spoke with countless journalists about it, yet still had as much passion for the car and the Design Loft’s work by the time we spoke with him as he did when the day started. After hearing Buzyn speak about the Audi PB18 e-tron, and seeing it in person, we hope the Audi Design Loft is responsible for more and more Audi designs, as their work is impressive.